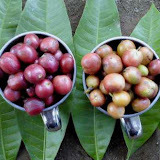 Koffie Goenoeng FairSHARE: New Arrival: Sumatra Classic Takengon Pondok Gajah the fruttiest fragrance and aroma ..
New Arrival: Sumatra Classic Takengon Pondok Gajah the fruttiest fragrance and aroma .. This posting has most partly appeared in our Facebook page. But now as we find help from our supplier-friend in the coffee cultivation area, we then change the nearly correct technical name of the coffee. We held coffee tasting test early April. Here is the cuppers’ preference. We get six coffees from different ecosystem background even though in the areas of Sumatra Aceh Takengon, yet the result is astonishing. There were three coffees from Takengon, Flores Manggarai, Sumatra Parapat & West Java Lembang Luwak. Sumatra Classic Takengon of Pondok Gajah gets score of 88.56; Flores Manggarai 85.36; Takengon-IOM 82.72; Sumatra Parapat 82.45; Takengon Other 81.10; West Java Luwak 80.14. The highest rated cup of 88.56 originates Sumatra Takengon managed by our local contact Rodiyan Syah, an agribusiness student from Bener Meriah in Aceh province. Congratulation! Your testers love you. No doubt. Apart from different characters, what we call Sumatra Takengon Pondok Gajah valued for most fruttiest fragrance and aroma. You won't believe unless taste it. But you, friend Rodiy, this is not because of you. But likely because Allah loves your people who have been granted with best environment that creates the coffee appreciated blindly by our tester-friends in Jakarta. Last but we don’t want to mention more: Based on our latest cup test, it is VERY CLEAR, civet for coffee is definitely not what matters. Sorry for luwak coffees promoters. 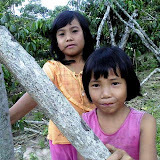 By the way, we have not had yet the Flores Manggarai. You still have to wait hopefully only until early July as the farmers pick the second harvested crop, which is expected to be better in taste, as many acclaimed cuppers claim their experience in coffee selection. What about price? Yes, as you already know: price hike, particularly for Flores Manggarai that has to be in the same level of Sumatra Classic Takengon Pondok Gajah. They will cost you now Rp50.000 per 250gram of roasted beans, either ground or unground. Hope you still love them ..